Willow Creek Inn (with wi-fi) - Just minutes off Parks Hwy. Hatcher Pass State Recreational Area. We do not accept American Express. We get charged international surcharge fees for AE cards issued in the U.S. on top of regular transmission fees. Please use VISA or MC when booking. * Come, get away from it all on this unique river-front property ! Known for excellent Rainbow/ Steelhead trout fishing. Willow Creek Inn is located in the foothills of the Talkeetna Mountains in the beautiful Susitna Valley with many outdoor opportunities available close by. Ask owner about recommended local fishing guides. 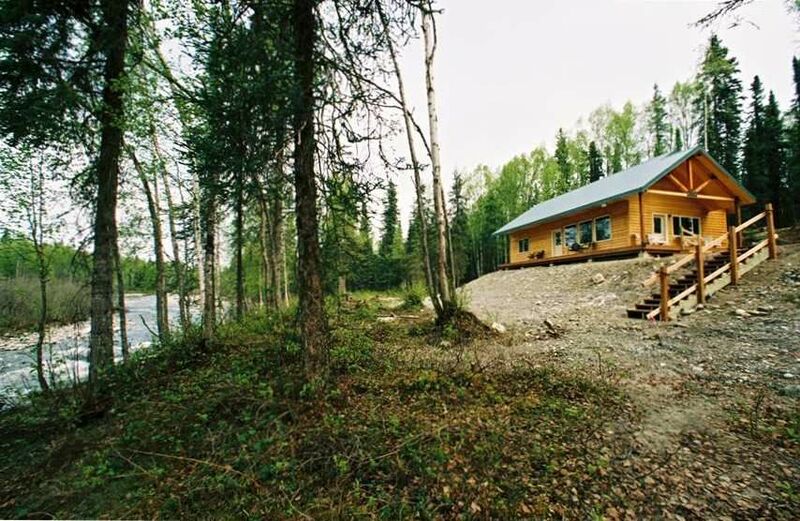 * The property is 27 acres of boreal forest with private river-front. Built with vaulted ceilings, oak floors, large screened windows throughout & beautifully furnished, sided on exterior with cedar. House sits up over the river with a beautiful view of the winding rapids. There's a long set of stairs, a trail & a short set of stairs to river's edge. There is a rocky/sandy area on the shore where guests like to sit by the river and enjoy the sounds of the rushing water. We keep outdoor chairs by the river. * Willow Creek has several species of trout; rainbow, steelhead and arctic grayling. The river in front of the rental is spawning ground for silver and king salmon. Animals natural to this area are river otter, lynx, moose, brown bear and black bear. You will often see bald eagles flying up and down the river as there is an eagle's nest in the top of a cottonwood tree across the river. *Fish for salmon as close as the confluence of Willow & Deception Creeks 3 miles downstream from the rental. Many streams crossing the Parks Hwy nearby are popular fishing spots. * Hatcher Pass State Park & the Nancy Lake State Recreation Area offer many hiking trails. Bring your camera! * The town of Willow is centrally located to many popular & scenic places to visit such as Hatcher Pass State Park, Independence Historic Mine, Nancy Lake State Recreation Park, Matanuska Glacier, Denali National Park. Willow is surrounded by the Talkeetna Mountains to the east & the Alaska Range to the west & north and has many lakes & rivers. The re-start of the world famous Iditarod Trail Sled-Dog Race is just 7 miles from the rental on Willow Lake. *In winter months you might view Northern Lights. Winter renters enjoy cross country skiing & snow-machining. The trail leading into Hatcher Pass is minutes away. *Towns to the south of Willow are Houston, Big Lake, Meadow Lakes, Wasilla and Palmer. To the north are towns of Talkeetna, Sunshine, Trapper Creek & Denali. * The house has 2 bedrooms with queen beds, lazy boy sleeper sofa. All linens are provided. We can also provide a twin air mattress. When needing sofa sleeper or air mattress, let us know in advance so that we can have bedding out. *Owners have nothing personal in the house, so you can make yourself at home. *The kitchen is well stocked with all the necessary dishes, pots, pans, etc. to cook & serve your meals. This is a full kitchen, with side by side refrigerator- freezer, stove - oven, microwave, dishwasher & various small appliances. Items such as coffee/filters, spices, flour, sugar, s&p, are kept in the kitchen. All paper plastic, items such as toilet paper, paper towels & trash bags are provided for your stay. Liquid dish soap as well as dishwasher tablets are provided. *Bathroom/bedrooms are well stocked with all bath linens. We keep shampoo, body wash & liquid handsoap in the bathroom for your convenience. *This home has a washer/dryer and we provide liquid laundry soap. There is no charge for the use of washer & dryer. * People from every state and around the world have stayed here and enjoyed the peacefulness of this river front property and absolutely love it! *Keys are provided on check-in date at the rental. Willow Creek Inn now has WiFi. Just minutes off the Parks Hwy on paved, state maintained road, this is a beautiful and mountainous area. Home to many rivers, lakes and much wildlife. This 27 acres was purchased in 2005, knowing well it would be the perfect place for a wonderful vacation get-away because of the unique & wild beauty of the riverfront. Construction of Willow Creek Inn began in 2006 and was open for rental in 2007. People from all over the U.S. and the world have enjoyed this wonderful riverfront property. This is gateway to Hatcher Pass State Recreational Area. WILLOW CREEK INN is centrally located to other areas popular with visitors. There's many things to do in Willow if you love the outdoors, love to fish or just enjoy scenic beauty & wildlife. WILLOW CREEK INN is private. The river is 75 feet from the rental and the sound of the water is soothing. This river is not accessible for motorized boats, but a favorite for rafters & kayakers. Guests have spotted and/or photographed a variety of wildlife on the property. The river is accessible by foot. Great fly-fishing for rainbow/steelhead trout. There are gravel bars you can access for fishing & gold-panning. There's an eagle's nest on the property which eagles occupy during the summer months & raise their young. Willow has excellent fishing guides who will take you down the river in a raft. In the winter, snow-machiners use the 'old military trail' to gain access into Hatcher Pass. Winter renters also enjoy viewing the Northern Lights on cold clear nights in the Northern Sky. There's a view of Denali (formerly Mt McKinley) 1/2 mile from driveway and at other locations along Willow Fishhook Rd (see pictures) & in Willow on Parks Hwy. House is 75 feet from river (river accessible to walk to) Long staircase leads to lower level of property near river's edge. All bed linens provided. Extra blankets are kept in bedroom closets. Plenty of bath linens provided. Extra bath linens are kept in bedroom closets. side by side refrigerator/freezer w/ice maker(cubed & crushed) & filtered water. variety of spices, baking soda, baking powder, flour, sugar, coffee & filters, tea, etc. gold pans/sluice box, Coleman cooler, metal fire pit & dried kindling provided. A cozy winter retreat close to the Iditarod restart, complete with moose in the front yard! Thank you so much for that wonderful winter review. We certainly do hope you will make it back. You were such considerate guests & the place was left so clean! Thank you and congratulations to a wonderful young couple! What a perfect paradise! It was one of the cleanest places we have ever stayed in. They pay attention to detail and are available right away only if needed. Very welcoming and neat people. We will be going back! Thank you so much for your wonderful review. You were great renters, thank you for doing business with us and we hope to see you again! Super clean, cozy, fully stocked cabin on the river. Wonderful place to kick back. Hosts are great. Thanks so much for your review. We appreciate that you chose our place to stay during your winter visit. You were great renters! This cabin is well supplied and decorated. The scenery is wonderful and the fire on the beach was very nice. Thank you so much and we are very pleased you enjoyed our rental. We also appreciate that you reserved with us at Willow Creek Inn. We appreciate your business! We had all the right things weather , clean cabin, and all the amenities of home. Great location Paul and Ginny ,we really enjoyed this trip . We will be looking forward on a trip back . Thank you both for renting with us! We appreciate your business very much. Thank you for reviewing our place. Everything was extremely clean the host were great we have been in alaska for four weeks but this place was the best. Wish that we could have stayed longer. If i come back too alaska this is the place that i really going too book again. The hatcher pass is very nice!!! Nancy en Paul thank you we had a great time here. We don’t often get to visit with our guests, but we are so glad we did. You were both so interesting to talk to as you are so well travelled. Thank you for sharing some of your time with us. You were wonderful guests & if you come back, would love to visit again! Thank you, we appreciate your business.